The girls of St. Andrew’s CYO softball team, Newtown, celebrates their archdiocesan championship June 14 at Archbishop Wood High School. 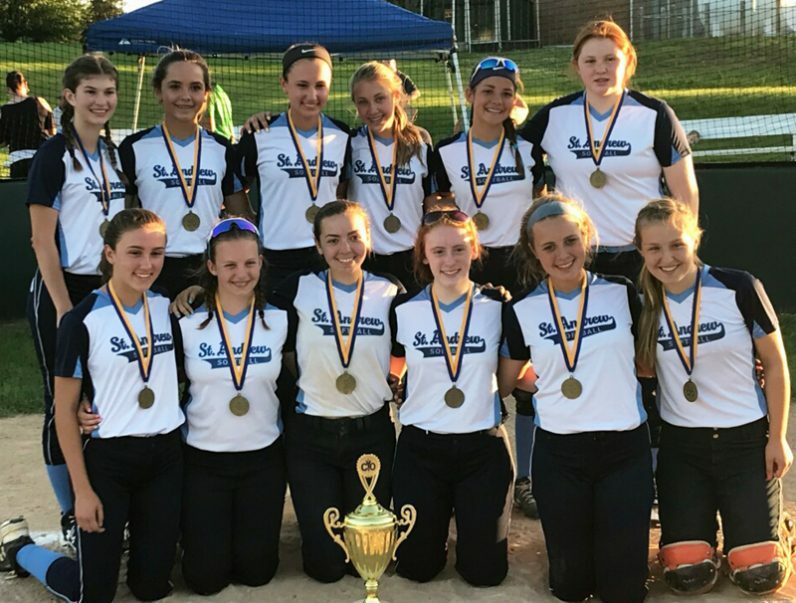 A five-run fourth inning broke open a tight game and lifted St. Andrew’s of Newtown to a 10-3 victory over Immaculate Heart of Mary, Philadelphia, in the archdiocesan CYO girls’ softball championship June 14. Hosted by Archbishop Wood High School, the event included use of a public address system that certainly helped make the moments more special for the seventh and eighth grade players and their families. St. Andrew’s meticulously seized control of the game and did not allow a run over the final three innings. Four different pitchers combined efforts, but it was a defensive play that emitted gasps from the crowd regardless of its rooting interest. In the top of the sixth, the Crusaders prevented a run by completing a very rare — and arguably awe-inspiring at this level — shortstop-first base-catcher double play. The twin killing ended the inning and culminated in an animated celebration along the bench/dugout. Zoldi said years of experience led the Crusaders to their first-ever archdiocesan title. “This group of kids has been playing together for four or five, some of them six years,” he said. “They all go to the same school and they all just came up together and they finally got to be eighth graders. We’ve been talking about this for the last two or three years. This is what their goal was, and they stuck it out and accomplished their goal and won it together. Zoldi is assisted by Bill Davis, Joe Rebl, Bill Gordon and John Evans. The team consists of Maria Gordon, Jillian Evans, Emma Zoldi, Abby Windish, Lauren Rebl, Zoe Shimp, Alyssa Fouss, Abi Evans, Megan Kraunelis, Brynn Davis, Grace Quick and Ava Green.